Have you ever seen demons in your whole life? If you haven’t seen then it’s good or if you have seen then it might be a good or bad experience. Some of you may even don’t know about the demons. Right? Okay! Not to worry at all! Sometimes you don’t know about the things around you, but experience them in your life! Anyways, demons are the fallen angels who are real spiritual beings who might have dangerous motives to harm you when they interact with you. But, if someday you face them in your real life than what you can do? Let’s see in this latest sensational game called “Demon Escape :Shadow Realm”. 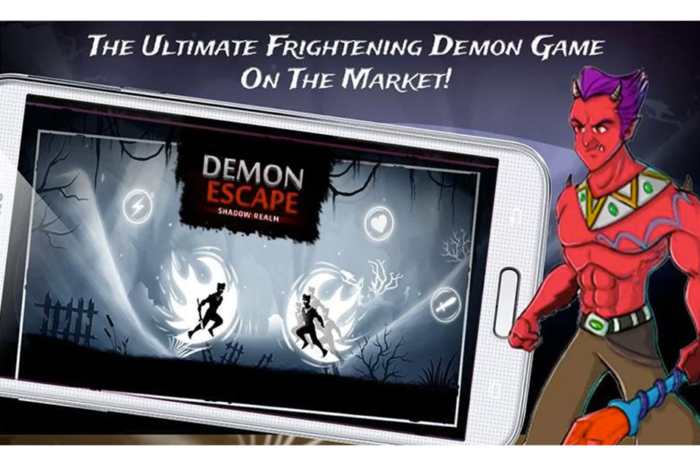 Demon Escape has been developed by Golive Games Studios AG. The game has been released on December 7, 2017. It requires iOS 8.0 or any later version of your iPhone, iPad or iPod touch. Now what this game is all about? Upon installing the game, you can read the rules and customize the settings of the game. Your main objective is to escape the shadow realm and defeat the demons who stand in your way.There are so many levels of the gameplay and to clear them by avoiding the shadow realm is your primary tactic. In this game, you need to build a strategy and choose your path of safety and escape the shadow realm. Your quest to destroy the supreme shadow demon has gone wrong. So you need to find a new way to escape by compromising your escape route and run through the shadow realm. You might not know that thousands of shadow demons stand between you and safety so try to avoid them. You need to act as the Legendary Demon hunters, either Neel or Laal, who is trapped in the shadow realm having a magic bow. You can use the magic bow and slay your enemies.Moreover, you can upgrade your bow and quiver to give your demon hunter special abilities which can help to escape the shadow realm. You have to avoid the demon shades with the simple swipe controls of the game. If you have not enough arrows, then you can collect more as you run through the shadow realm and use them to defeat your enemies from range. It’s your choice whether you want to save your arrows for the right time or just run towards the evil shades and your arrow will automatically fire within that range. You can swipe up or down to make the demon hunter change levels and dodge the shades because he is always moving forward. Overall, Demon Escape is an amazing, endless adventure game which not only tests your reaction speed but also your strategies. All you need is to play your role and build awesome strategies to run from the shadows, choose the safest path and survive and slaughter demons for as long as you can! The app is available on the iTunes Store for absolutely free of cost. So get it now! Pros: role playing game; challenging; based on strategies; tests your reaction speed; simple controls; magic bow available; endless gameplay; super-addictive game; brilliant graphics; free. There are numerous new game releases coming up in 2018 which you should watch for to get your hands on your favorite game. Visit Frugal Trend Setter for unbiased game reviews in all categories. Demon Escape is an amazing, endless adventure game which not only tests your reaction speed but also your strategies.